On the summer solstice I was stomping over Bodmin Moor with a bunch of friends intent on watching the sun sink behind a tor. Luckily we had a picnic to sustain us. We had plenty of delicious fare to eat and drink but these 10 summer solstice chocolate recipes for June’s We Should Cocoa would have been a welcome addition. What were you doing? If you’d like to join in with next month’s #WeShouldCocoa, scroll down to the bottom of the post and you’ll find the July link-up. If you haven’t joined in before or need a reminder, you can find the guidelines on the We Should Cocoa page. Bright pink beetroot & chocolate cupcakes from Only Crumbs Remain were a great start to the month. Angela tells us they are equally good, with or without the topping and of course they go towards our ten a day. I have to say I haven’t quite grasped this unicorn thing, but there seems to be a lot of it about. Here’s some unicorn millionaire’s shortbread from The Baking Explorer. I can’t resist a brownie, so these Ferrero Rocher brownie bites from Chez Maximka are very welcome indeed. One of the nation’s favourite chocolates along with one of their favourite bakes, who could resist? Chocolate and mint are one of my favourite combinations, so I got just a little bit excited when I saw this fresh mint chocolate cake from Farmersgirl Kitchen. I’d love one for my birthday please, Janice. If you like bread and butter pudding, you’re going to love this super deluxe versions from Jo’s Kitchen Larder. Chocolate brioche pudding with raspberries – mmmmm! It’s a slightly healthier brownie from me this month. I love to indulge, but I also like to think I’m getting some nutrients from my bakes too. I give you my dairy free coffee brownies with almond nut butter. You can’t have a summer solstice post without strawberries. They are the king of fruit in June. Foodie Quine comes to the rescue with these picnic ready, right royal Scottish strawberry, almond and chocolate chip muffins. For something completely left field, The KitchenMaid is sharing black garlic chocolate mousse with black garlic toffee. Lucy tells us not to be afraid “black garlic just deepens and enriches the chocolate flavours”. I’m intrigued. Now, I just need to get my hands on some fermented black garlic. And more scrumptious brownies. These vegan brownies with optional dulce de leche swirl from Green Gourmet Giraffe sound like there’s no option at all. Brownies were certainly popular last month, here comes another one. Cocoa and tayberry brownies from A2K – A Seasonal Veg Table. Shaheen assures us she’s not that fond of chocolate, but these were the 4th batch of brownies she made in June. Turns out there were actually 11 summer solstice recipes. I must apologise to Chris at Cooking Around the World for having to do the round-up a little early. Luckily, I didn’t miss it all together as this strawberry mascarpone chocolate cake is amazing: cake, strawberry jam, cream, strawberry frosting, fresh strawberries and chocolate – just wow! 10 Summer Solstice Chocolate Recipes. PIN IT. Hahaha, thanks for letting me know that Unicorn is out – just as I’ve discovered it too 😉 I’ve just been spending time with my young cousins from Melbourne and I think they would very much like anything unicorn. Taking a baking chocolate break, but I may give in come mid July. but right now KitchenMaid’s Black garlic chocolate mousse with black garlic toffee has me very interested. Oh well I hope your chocolate mojo appears before the end of July Shaheen. I always look forward to your entries. As for Lucy’s black garlic, it sounds very intriguing. Terrific round-up. There are so many delicious goodies. Luckily or not, I am far away from my kitchen and there is no chance to try anything, but … I guess I want brownies soon. Beautiful collection of goodies and love your Summer Solstice theme. Fresh mint chocolate cake especially caught my eye, will be taking a look! Yes, that mint chocolate cake sound fabulous and a great summer bake I reckon. Fab round-up! So many inspiring recipes, and such a variety of great ideas. Indeed, I always look forward to seeing the #WeShouldCocoa entries. Thanks for taking part. Oh and your contribution was very much missed Kate. I’d hate to think you’d gone on chocolate strike. Wow so many drool worthy options this month! 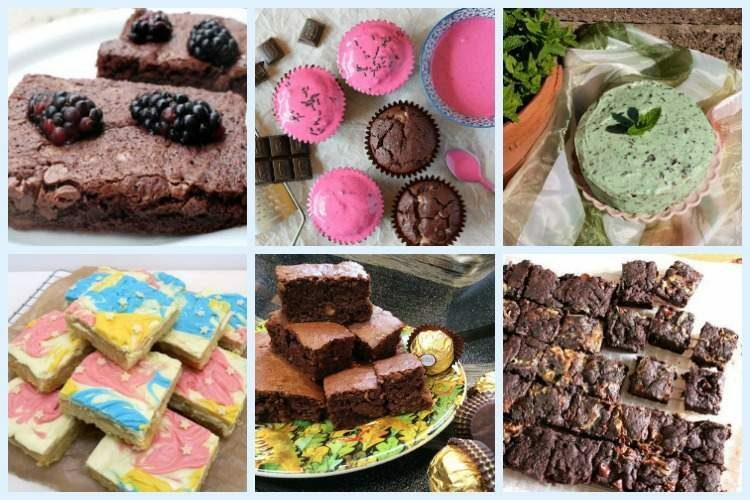 Loving the look of those vegan brownies from Green Gourmet Giraffe.